In the previous pAsruam maNavALa mAmunigaL requested SrI rAmAnuja to show light to him who is suffering in the eternal darkness and ignorance of this materialistic world. In this pAsuram, he goes ahead and says that he is being controlled by his body and so he goes in the direction that his body pulls. maNavALa mAmunigaL says that this action of his would only cast a bad image on his father SrI rAmAnuja. sellumadhu un thEsukku thIngu anRO? isai – only you should take action on this. un thEsukku – and you glories? nIsarkku Atcheyya sagipparO – will they tolerate (their sons) performing lowly acts to low people? maNavALa mAmunigaL tells SrI rAmAnuja about the way in which he leads his life. maNavALa mAmunigaL says that he is being controlled by his body and he just blindly goes behind whatever direction it pulls him day in and day out. maNavALa mAmunigaL tells SrI rAmAnuja, “Hey my father! What I am doing is extremely low act. If you do not stop this, will it not cast a bad image on you, as you are my father and me, your son is going in the ways that is not prescribed? If great mahAthmAs and great souls who are the pioneers in research matters containing brahmam (the supreme being Sriman nArAyaNan), if they see their sons go astray, will they tolerate it? Will they not quickly turn their attention towards them and revive them? In the first half of this pAsuram, maNavALa mAmunigaL described how he spends his life. Ideally, maNavALa mAmunigaL should have been spending his life by chanting the names of Sri rAmAnuja, as expounded by the phrase “un nAmamellAm enRannAvinuLLE allum pagalum amarum padi nalga (irAmAnusa nURRandhAdhi thaniyan). maNavALa mAmunigaL says that he had the golden time where he could have ideally chanted the glorious names of SrI rAmAnuja day in and day out. On the contrary, during those times, maNavALa mAmunigaL says that his spent his life according to the phrase “annAL nI thandha Akkai vazhi uzhalvEn (thiruvAimozhi 3.2.1). The meaning of the phrase is that a person spends his life as dictated by the body that was originally bestowed upon him by SrIman nArAyaNan, to lead a pious life. This body was given to perform acts prescribed in the scriptures towards SrIman nArAyaNan. It is not to indulge in materialistic ways. If it does, then the bad image will be cast only upon the one who gave the body in the first place, that is sriman nArAyaNan. 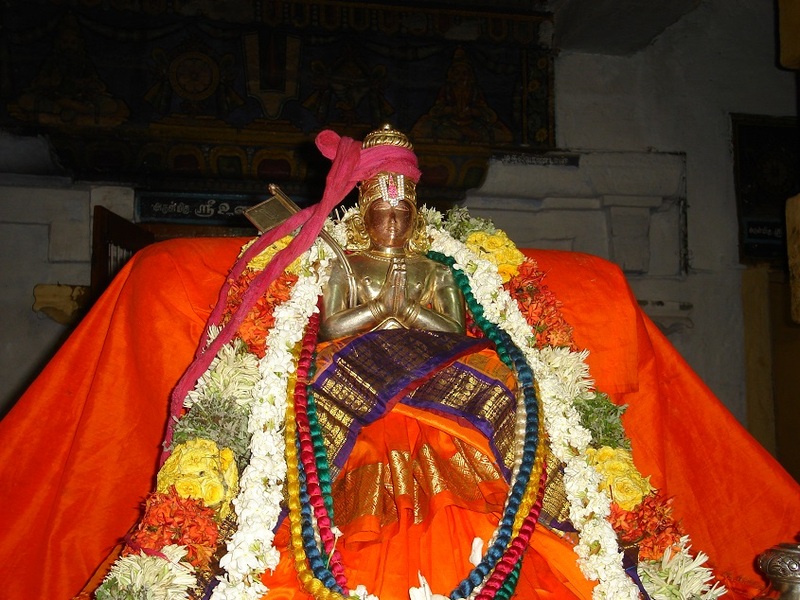 This was the purport of periyAzhvAr’s pAsuram in his “unakkup pani seydhirukkum thavam udayEn inippOi oruvan thanakkup paNindhu kadaithalai niRka nin sAyai azhivu kaNdAi” (periyAzhvAr thirumozhi 5.3.3). maNavALa mAmunigaL asks the same question as periyAzhvar, but the only difference is that while periyAzhvAr asked SrIman nArAyaNan, maNavALa mAmunigaL asks SrI rAmAnuja that would it not cast a bad image upon him, his father? maNavALa mAmunigaL justifies his statement by giving an analogy. There are very knowledgeable people who indulge spend their life in thinking of the ulterior path and motive in SrIman nArAyaNan. If, for some reason, their sons go astray and lead a treacherous life, will their fathers approve it? Will they accept their sons’ low condescending acts performed towards inferior people? They would never approve of it. maNavALa mAmunigaL tells his father SrI rAmAnuja, “Hey my father!! The leader of sanyAsIs. You yourself had mentioned of this fact and case in hand. Hence, I request you to take me into your fold, take services from me and protect this soul. Only you can do it”. This entry was posted in Arththi prabandham, Other and tagged arththi prabandham, mamunigal, ramanuja on August 4, 2016 by santhanam rajagopalan.